Luxury Fincas & Villas for Sale in Sineu | Montemar S.L. In order to live well in Mallorca, proximity to the sea is not the only criterion. If you would like to consider all four coasts, all towns and places of attractions as your favourite destinations, you should choose a place of residence in the centre of the island. The town of Sineu, for example, is located centrally in the Pla de Mallorca region. As befits its central location, Sineu is surrounded by a radiant-like road system, so that roads lead in all directions and to every coastline. There is a lot to see, taste, discover and buy on Sineu Market Day - Wednesday. Then also visitors stream into this otherwise rather tranquil place. The splendid old town with its characteristic cellar pubs is another highlight of the city - due to the rather rare tourism, the dining prices are still reasonable. 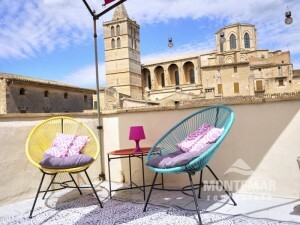 Montemar Real Estate is your reliable partner when it comes to finding a villa or finca in the best location and luxury amenities on the central Majorcan countryside. We publish all our first class real estate offers as soon as available with all the key facts and photos, always striving to make your dream come true under the Spanish sun. The area around Sineu is part of our field of business, which we manage locally. Therefore, we are able to answer all your questions about our offers in the most convenient way.